YouTube can be one of the most powerful marketing tools in your online arsenal, but the sheer volume of content makes building a successful channel a challenge. You need a coherent marketing strategy, high quality videos, and regular content and strategy audits to evaluate your progress. To make high quality videos you’ll need some equipment, editing software, and technical know-how. TubeBuddy for YouTube can help you with everything else. TubeBuddy is a browser extension designed to help YouTubers grow their channels. It is available for Chrome, Firefox, and Safari, and there are plans to extend it to Microsoft Edge as well. There are four different versions of TubeBuddy for YouTube: Free, Pro, Star, and Legend. All four provide a variety of tools designed to streamline channel management and video optimization. The Free version comes with pretty severe limitations, and the Legend plan gives users access to every feature TubeBuddy has to offer. The free TubeBuddy plan gives users access to several powerful features, including an Upload Checklist featuring best practices, limited versions of the Thumbnail Generator and Suggested Tags tool, and access to detailed Channelytics and Channel Valuation services. Who is this plan suitable for? You should consider installing the free version of TubeBuddy to get used to the interface while your channel is relatively new. It will help you develop a proper strategy and start thinking like a professional YouTuber. Should you invest in a premium TubeBuddy plan? If you have a YouTube channel, you should probably have TubeBuddy. But should you invest in a premium plan? That depends entirely on your goals, the number of resources you’re able to commit to the channel as a whole, and the size of your channel. If your channel is really just a place to host a handful of videos, you don’t need TubeBuddy at all, let alone one of the paid plans. If, on the other hand, you want your channel to become a major aspect of your business, you’ll eventually want to sign up for one of the paid plans. In other words, you don’t want to invest in a premium TubeBuddy plan until you’re already seeing some results from your channel. End Screen Templates – These templates allow you to direct viewers to other videos or even external links at the end of your videos. Card Templates – These templates make it easy to add links at relevant points throughout new videos as you post them. Tag Sorter – This makes it easy to reorder the tags associated with any video on your channel. Best Practice Audit – TubeBuddy will automatically check your videos and analyze your channel to make sure that you’re following YouTube’s suggested best practices. Channel Health Report – You can have TubeBuddy compile a report about the overall health of your channel at any time. Who is this plan best for? If you’ve gotten comfortable with YouTube, built a mild following, and you’re ready to take a more active approach to growing your channel, the Pro plan is a great place to start. In the interest of full disclosure, this is what I use on my YouTube author channel. The Star plan is the second premium tier of TubeBuddy for YouTube. It comes with access to almost all of the features created by TubeBuddy. On top of all the features listed in the past two plans, the Star version of TubeBuddy gives you access to things like scheduled video publication, bulk updating options, and the ability to back up your entire channel at any time. Who is this plan best for? Is your channel starting to gain some momentum? Do you have dozens of videos published? Are you looking to make YouTube a more important part of your business? If you answered yes to all three questions, it’s worth considering the Star level of TubeBuddy. TubeBuddy’s Legend plan gives you access to every single feature TubeBuddy has to offer. This includes everything we’ve already talked about, access to video A/B testing, and the ability to view Competitor Scorecards so you can see how your channel matches up to the competition. Who is this plan best for? You should only consider investing in TubeBuddy’s Legend plan if you’re seriously committed to making YouTube work and you already have a considerable audience. Our ThemeIsle channel uses this version of TubeBuddy for YouTube, but our newer CodeinWP and Revive.Social channels don’t have it yet. Even at the free level, you can use TubeBuddy for YouTube to build a considerable amount of your video marketing strategy. Its tools apply to every stage of the creation process: planning, publishing, and marketing. With a little help from TubeBuddy, you can plan content your audience will love. You can do this using TubeBuddy’s video topic planner. 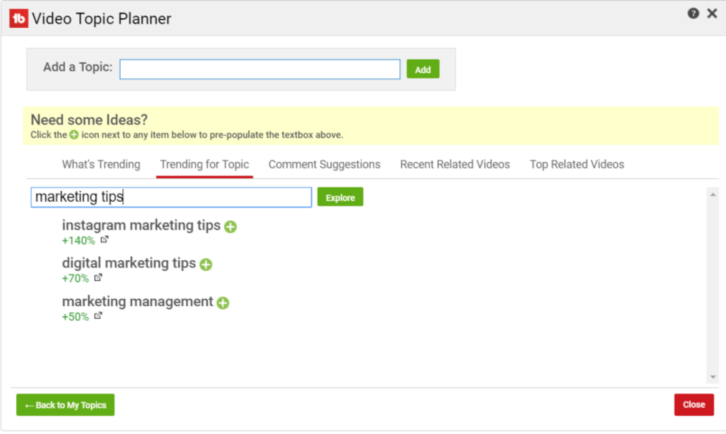 The Video Topic Planner can help you identify trending topics that are relevant to your channel. You can access it from your YouTube account. Press on the TubeBuddy logo near the top right corner of your page and a menu will pop up. You’ll find “Video Topic Planner” listed in the bottom right section of this screen. Once you’ve launched the Video Topic Planner, you’ll be able to look at YouTube’s top trending videos or search for trending topics that are relevant to your channel. You can then capitalize on these topics by creating your own videos about them. You can click the green “+” button beside an interesting topic to add it to your list or enter a similar idea of your own using the “Add a Topic” button at the top. This will start a list of topics, which you can then refer to any time you’re feeling stumped about what to film next. The Tag Explorer is one of several tag tools that can be accessed from a panel in your video publishing or editing screen. 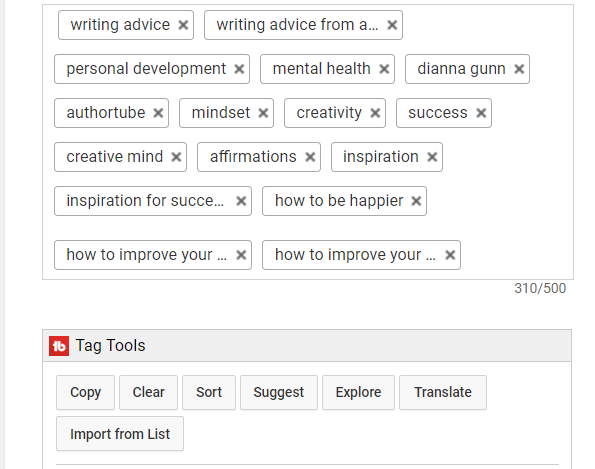 You can find it directly below the existing tags for the video you’re working on. When the Tag Explorer opens, you can use it to search for any tag you’re interested in using. It will then help you find relevant keywords. It will also give the keyword you’ve chosen a “Keyword Score”. This determines whether or not the keyword is worth targeting based on the number of searches for that tag versus the number of videos competing for it. The Tag Explorer will also automatically share some relevant keywords you might want to use. 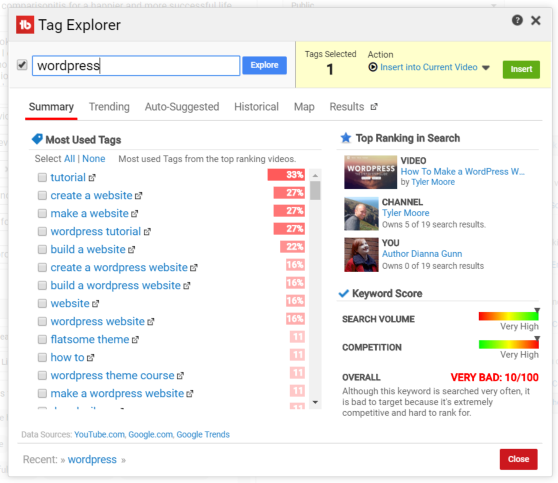 With this tool, you can find relevant tags your videos can actually compete for. You’ll also be able to gauge how hard you’ll have to work to compete for those tags. From there, you can assess whether or not it’s worth targeting. The Upload Checklist, or best practice checklist, is exactly what it sounds like: a list of things you should do if you want your video to be successful. TubeBuddy places this checklist in a prominent place on your video editing or publication page, making it easy for you to run through the list as you’re waiting for your video to upload. 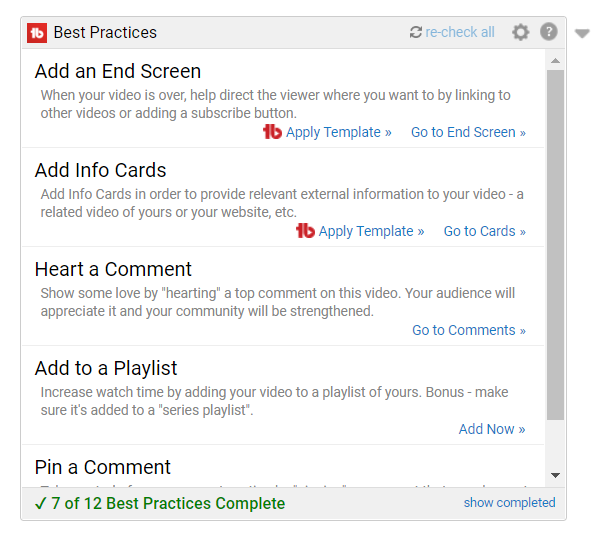 Your account will automatically use the TubeBuddy default checklist, which is based on YouTube best practices. You can also choose from checklists provided by popular YouTubers, or customize your list based on your channel’s unique needs. When you’re first starting out, we recommend sticking to the automatically generated list. Make it a habit to run through every item on this checklist before publishing videos. One of the best things about TubeBuddy is its primary promotional tools come with every version of the extension. This feature allows you to see what other social media networks your subscribers are using, so you can reach out to them and build relationships in multiple places. It can also help you figure out where to focus your video marketing efforts. This tool allows you to easily share your videos on a variety of social networks. It also tracks where each video has been shared. You can access the share tracker by going to the Videos list inside the Video Manager section of your channel’s Creator Studio. You’ll see a clickable TubeBuddy logo beside each video. Click on it and you’ll see a variety of options, including “Share Tracker”. From there, you can easily share your video to each network, and check them off as you do. With the Pick a Winner tool you can automatically select a random commenter. This makes it easy to choose topics based on commenters’ suggestions, or to randomize giveaways on your channel. You can find “Pick a Winner” in the same area as the Share Tracker tool. This feature lets you share one video – like your channel trailer – in the description of all your other videos. This encourages visitors to explore more of your channel. In this guide, we’ve covered the core benefits of using TubeBuddy for YouTube, but these are only a few of the ways you can use this powerful extension to build your channel. To experience its full rewards, you’ll need to install the extension yourself. The post TubeBuddy for YouTube: How to Build a Video Marketing Strategy With It appeared first on Revive Social.